My father used to say to me, “son, when it’s time to study, study with all your mind. When it’s time to play, play with all your heart.” I aim to take his advice. At Ekko, we like to party. Actually, Jesus liked to party. When he ministered he was focused. He listened well, he preached eloquently, he healed with power, he loved God’s children with all that he had. But when it was time to mingle, party, celebrate, dance, he was all in as well. Life with Jesus is a serious endeavor but it should also be a joyous one. Every Fall/Winter Ekko lets her hair down and begins to celebrate life in Christ and His Community. It all starts with our October Party. 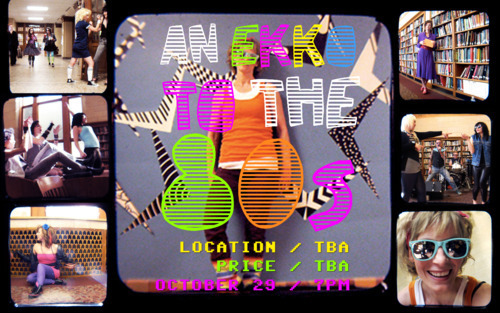 "An Ekko to the 80’s" is our version of the Halloween party. It’s going to be very funky night filled with laughter, food, and 80’s dance moves! As one Young M.C. has put it, it’s time to “Bust a Move”… I’ll see you in the 80’s.